I was seriously berated the other night by my fourth grader, then my fifth grader and finally my husband: "You mean, you haven't told them about the corn?" They were drop-the-jaw shocked that I hadn't shared with you quite possibly their favorite, quick and easy vegetable side dish: sauteed corn. We eat it at least once a week. I know: why haven't I told you about it? Don't you get started too! I guess this side dish is so simple, that I forgot to share it. Trust me, it lands on our table often. Of course I should share it with you: what was I thinking? 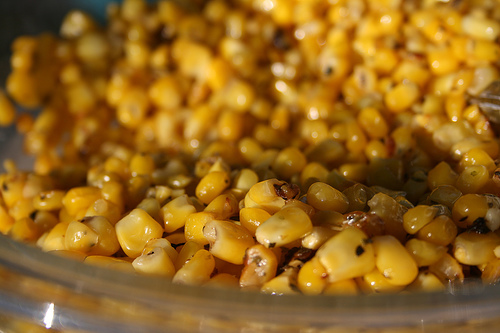 Put corn into colander in sink and rinse with lukewarm water to thaw; let drain. Heat sautee pan, with olive oil and butter, over medium heat. Add corn, with salt and herbs, and sautee for 10-12 minutes. Off heat and serve.